Only in Taiwan could you be stranded in the middle of nowhere late at night, in a dimly lit shop surrounded by massive wooden lion masks, and have a man known as “the Lion King” sit on a hand-carved wooden throne, chatter on his mobile and simultaneously perform a traditional tea ceremony to pour you an exquisite cup of tea. Did I mention he was wearing a t-shirt emblazoned with a drawing of one of his lion masks? We were three obviously desperate girls who had just arrived and failing miserably at finding a rental car. Well, I don’t even have a driver’s license so I definitely could not rent a car. I was just dead weight at that point. Second, we didn’t appreciate that it was a Taiwanese holiday and most businesses were closed, from car rental shops to taxi companies. It was the Lion King who saved us in the end, and, while he poured our tea, organised a ride to our guesthouse deep in the Taitung countryside. God bless the Lion King. Our short girls jaunt to Taiwan was full of beautiful surprises. I was there with two dear friends: Nana Chan who owns the loveliest tea cafes in Hong Kong as well as an online shop for her bespoke teas (Teakha and Plantation) and Beverly Chan-Carver of design studio, Life at Studio B., and my calligrapher of choice. The new Sook logo at the top of this page, my personal stationery, and basically any calligraphy or hand drawn menus I use have been Bev’s handiwork. Yesterday, I’m gutted to report, Beverly and her husband Jay abandoned us to move to the UK. I already miss Bev, her impeccable aesthetic sense and her unexpected addiction to Boomerang. Since we met, we've spent hours daydreaming of outdoor guerrilla dinners that would be perfectly lit, strewn with wildflowers and celebrating life mindfully and oh-so-Kinfolkfully. We managed to work together on a few events and Bev made everything she touched more beautiful. Hong Kong’s huge loss is the UK’s gain. So as our last hurrah, before she left us, we retreated to the Taiwanese countryside with Nana as our guide. Once the Lion King sorted us out, we decamped to a charming guesthouse called Sunny Buhouse an hour’s drive from Taitung. Sunny Buhouse is run by a contemplative, older couple who have retired to the area. Their guesthouse is in the midst of Taiwan’s infamous mist-shrouded mountains with expansive views from the balconies and rooftops. We were served clean but lush vegetarian breakfasts of multi-grain porridge, Taiwanese pickles and jams, and Taiwanese fruit, with which we drank tea, obviously. Over breakfast, I talked with the husband about urban life in Seoul and Hong Kong. “Everyone is so busy, but is the younger generation happier than their parents were? Do they have hope?” he asked me with compassion evident in his eyes. I didn’t have the answer (still don’t) but pondered the question later while his wife practiced Reiki on us. Then, Nana, Bev and I all were shown how to flail ourselves with rubber batons until we turned black and blue as part of a traditional detoxification technique. Our girls trip had unintentionally turned into a detox vegan retreat. For our first night’s dinner, the husband recommended a Buddhist vegetarian restaurant with the most comforting home-style food that makes me want to research all of the Buddhist cuisines of the world. To recover from our self-inflicted bruises, we strode up and down the beaches swinging our arms emphatically to flush out our lymphatic system. We gingerly tiptoed through fields of marigolds which calmed our monkey minds. For me the biggest surprise of this trip was finally seeing the similarities between Taiwanese and Korean cooking and food culture. Among the rice paddies, I was reminded of my family’s farms in Korea. I had to be outside of Taipei meeting local makers to notice the heavy reliance on fermentation for flavour and preservation that I primarily know from Korea. We first visited a brewer of fermented elixirs originally made for Buddhist monks that purportedly can cure any ailment. Her face was badly burned when she was younger, and she lost her sight in one eye. 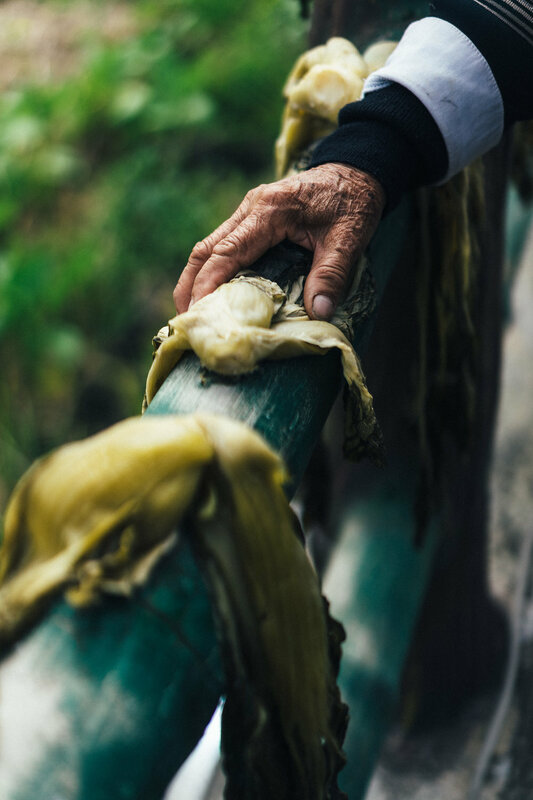 She went to a Buddhist monastery in despair and penniless and was encouraged to make a healing fermented drink from local herbs for the monastery. The all-purpose version I tasted seemed similar to the drinking vinegars popular in Korea for their digestive health benefits. Inspired by her, I’m currently experimenting with making vinegar at home (which takes months), so watch out for a future post on drinking vinegars. 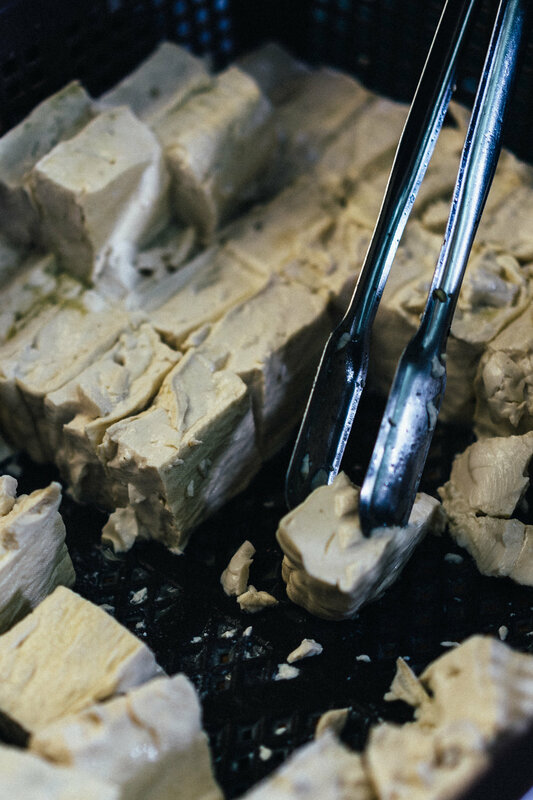 Along with our fermented, probiotic-abundant tinctures, I had the best stinky tofu I’ve ever tried. This tofu was clearly handmade and probably had been fermented in a brine of milk and aromatics for weeks. Stinky tofu can be fermented for months, and to be honest, the stronger taste and, well, stink had put me off when I’ve tried it before. This stinky tofu was of a younger vintage, which was just fine with me. Cubes of the subtly fermented tofu were deep-fried in huge woks, and then served with pickled cabbage, a sweet soy sauce and chilli sauce. Once I had a bite, I understood the queues from this outdoor stall in a random village surrounded by rice fields. The ladies behind the counter had sweat beading on their brow as they relentlessly ladled out tofu to satisfy the hordes. And then there was the glorious woman who was tending to her pickled mustard greens as they dried in the sun. The mustard greens came from a garden patch beside her small home among the rice paddies of the town Chih Sang. 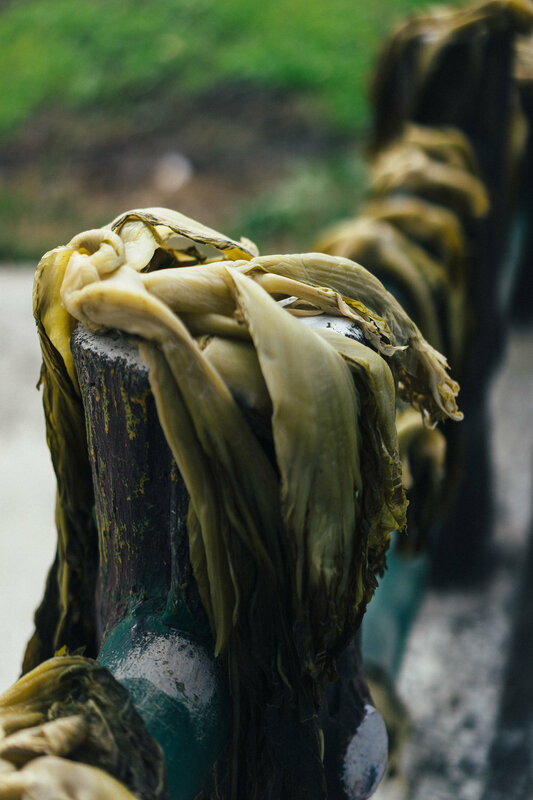 Each bunch of mustard greens rested on her fence like a marooned octopus. The row of jade-tinted tentacled pickles seemed endless. The farmer happily chatted with us in Mandarin through Nana as she adjusted the leaves of the greens. Her face and hands were bronzed and carved by the same sun that hit the fence. She tore off pieces of her homemade pickles for us to sample. The brine of the pickle was bright and the greens were crisp. I much preferred the freshness of her pickle to the ochre-coloured pickles in vacuum packs that you find in the market here. We enjoyed standing with her in the sun and when we made a gesture to leave, she started handing us fistfuls of greens. If we hadn’t protested, I think she would have given us a bushelful. We did leave with three large bunches of greens (one each) which we carried home to Hong Kong like Taiwanese treasure. Everything was just inspiring in the Taiwanese countryside. I can’t say it more plainly than that. Though provincial in the literal sense, there was a sense of unfussy elegance. The fermented tofu was restrained yet earthy; the mustard green pickles were unassuming yet picturesque. Even the Lion King, with his Lion King t-shirt, knew how to appreciate a perfect cup of tea. Which is to say that this trip was the perfect send-off for our Bev who exemplifies all of these qualities (minus the self-referential T-shirt). She is off to establish a retreat in the English countryside with her husband, Jay. I have no doubt that their retreat will capture all of the grounded and humble refinement that we experienced in Taiwan. In their honour, and in the honour of the lovely folks we met in Taitung, and for Nana, my next post will be a recipe for vegan zha jiang sauce over rice using pickled mustard greens - my version of a dish we had at the Buddhist vegetarian restaurant near Taitung. I look forward to making it for Bev and Jay at their retreat someday - safe travels, my loves!